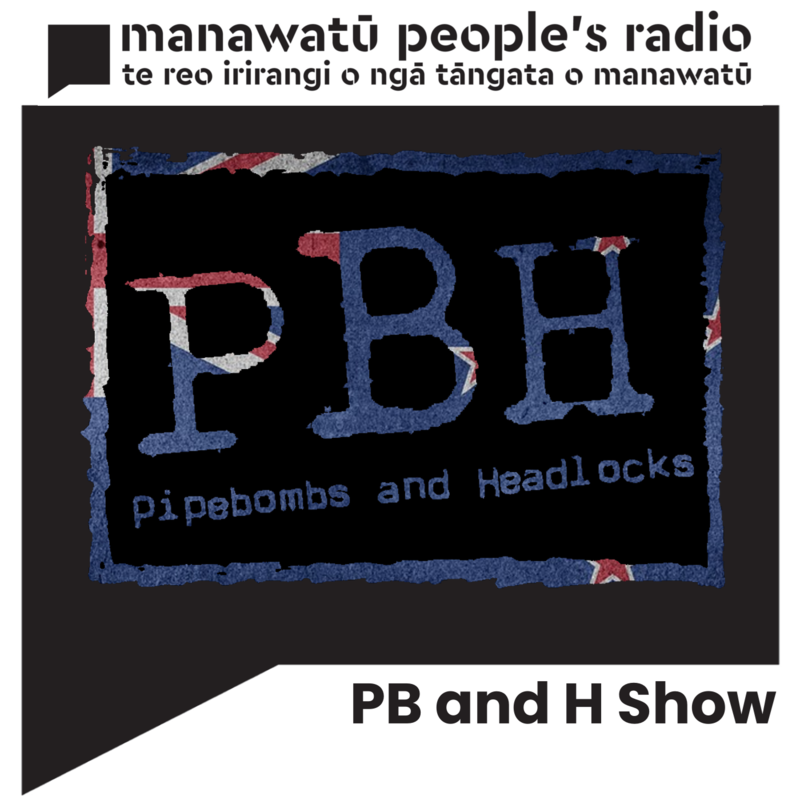 Welcome to Pipebombs and Headlocks, a show for all things wrasslin! Hosted by local wrestling fans: The "Voice of Reason" Sammy G, and Ravishing Rosie Rude! Join us for hour long (minimum) discussions on the latest happenings inside and out of The Squared Circle! CPW's THE RETURN, and 'RUFGUTS' RODDY GUNN - Ravishing Rosie Rude's top secret Wellington location is home of tonight's episode! She is joined by Sammy G to talk through CPW's Good Friday show, THE RETURN, as well as promoting more of the NZ Scene. For the rest of the show, 'Rufguts' Roddy Gunn jumps in to talk about his background in wrestling fandom/training, getting into booking, a story about RAVEN, plus an exclusive UCW Scoop, and much much more! THE PBandH SUPERSTAR SHAKEUP 2019 - Ravishing Rosie Rude joins Sammy G in the studio, as well as special online guests Jay Marshal (Capital Pro Wrestling), and David Dunn (Impact Pro Wrestling/NZ Pro-Wrestling Informer) to talk about WrestleMania 35, as well as taking part in a special WrestleMania Quiz! Podcast Extra(s) - Our take on the WWE Superstar Shakeup! Plus, Rosie and Sammy G run through more of the NZ Scene, and Rosie's training session with Hughes Academy on Saturday! WRESTLEMANIA 35 - Sammy G and Rosie Rude were in Wellington for The Hudson's screening of WrestleMania 35! Before running through the Show of Shows, they discuss NZ Events, NXT TakeOver: New York, and The 2019 WWE Hall of Fame! WRESTLEMANIA HYPE - Sammy G is joined in the studio by Rob Wilkenstein, with Rosie Rude beaming in via digital magicalness-ness! The team run through recent/upcoming NZ Shows, as well as giving their thoughts on the NXT TakeOver: New York and WrestleMania 35 cards! PLUS: A special WrestleMania Creative Challenge was set for the team - hear their answers in the Podcast Extra! RADIO WITH A LIVE AUDIENCE - Sammy G and Rosie are joined by Lance Havoc live at the Festival of Cultures 2019 in The Square - Palmerston North! Featuring NZ Updates, plus in the spirit of the festival, Rosie talks a bit about the Lucha Libre Style! Lance tells us a bit more about Sweden, and faces off against Sammy G in the first ever "Rosie Rude Wrasslin' Quiz"! CPW CPW CPW!!! - Sammy G and Rosie Rude give a few updates on the NZ Wrasslin' scene before going through the recent Capital Pro Wrestling show in Epuni on Saturday Night. Plus, due to her disappearance last week, we get Rosie's thoughts on the recent WWE Fastlane event. NZ UPDATES, CPW, and WWE FASTLANE 2019 - "The Voice of Reason" Sammy G is joined by a digital Rosie Rude to talk about upcoming shows around the country, as well as hype for the upcoming CPW Show this weekend in Epuni - as well as covering some news... then things get weird! In the second and third parts of the show, Rob Wilkinstein and Sammy G go through the WWE Fastlane event, as well as hypothesize a few WrestleMania scenarios! NZ Updates, WWE News, and BRYANT! - Join Sammy G and Rosie Rude for the latest updates from across NZ, as well as news from America and Japan. In the second half of the show, they give current Triple-Crown NZ Champion, Bryant, the Pilot Treatment (including Rosie's run of questions!) discussing his background in pro-wrestling, before going into a Podcast Extra to talk about recent events at CPW's Live Pro Wrestling show in Epuni, and much more! NZ Updates, CPW, and Elimination Chamber 2019 - Ravishing Rosie Rude, and Sammy G run through recent show results from around NZ, as well as upcoming shows. They attended Capital Pro Wrestling's Live Pro Wrestling show over the weekend and give a run-down on the card. PLUS they talk about "The Angry Basket" (The Elimination Chamber) 2019 event as a Podcast Extra! CPW, Lance Havoc, and a DRAFT - Rosie Rude, and Sammy G had an epic weekend in Wellington with Capital Pro Wrestling as part of the Richter City Roller Derby's Spills n Thrills event! They give a quick rundown of matches, plus some hype for this weekend's CPW Live Pro Wrestling show in Epuni! In the second half, the team are joined by THE RETURNING: LANCE HAVOC!!! He shares stories of his time in Sweden with STHLM Wrestling, his newfound love of pastry, and has some choice words for his opponent this weekend - Rufguts Roddy Gunn! EPISODE 50 - Rosie Rude and Sammy G run through upcoming NZ Events, as well as their IPW: Whanganui Warfare thoughts/results. In the Podcast Extra they give their thoughts on WWE Elimination Chamber 2019, as well as WrestleMania 35 build, and how Rosie would fix WWE! NZ Updates, NXT TakeOver, WWE RR 2019 w/ Rob Wilkinstein - Sammy G, and Rosie Rude, are joined in the studio by Rob Wilkinstein to give his thoughts on recent WWE/NXT Events, plus updates from Asylum Pro, SPW, CPW, and hype for this weekend's IPW: Whanganui Warfare show! NZ Updates, NXT TakeOver: Phoenix, and WWE ROYAL RUMBLE 2019 - Rosie Rude, and Sammy G, give some quick updates on the NZ Scene, as well as their thoughts on NXT TakeOver: Phoenix, and of course, the WWE Royal Rumble 2019! MANALANCHE - Ravishing Rosie Rude, and Sammy G are joined in the studio by Ben Mana, and on the phone by Ben's tag-team partner: Adam Avalanche! Discussing how they got into wrestling, how MANALANCHE started, and much MUCH more! The Super Spartans - Rosie Rude and Sammy G kick off 2019 with Superhero Jay Marshall, and 'The Spartan' Sam Black! Xmas Special! - Sammy G and "The Christmas Ruiner" Rosie Rude, discuss TLC 2018, with a couple of Wrestling-related Xmas tunes in the spirit of the season! ROSIE'S RETURN - We have not heard from Rosie since MitchellMania, but after a month in The United Kingdom, Rosie is BACK on PBandH - she joins Sammy G in the studio to talk NXT TakeOver: WarGames, Survivor Series, TLC, and more! Plus, results for IPW's Nightmare Before Xmas from the weekend! NZ Scene, Get Mitchell to WrestleMania Update, and Triple H Appreciation Day - Sammy G is in the studio by himself again this week! Giving a run-down on recent NZ Events, as well as looking at the upcoming Nightmare Before Xmas event for IPW. Plus, an update on the Get Mitchell to WrestleMania campaign, and talking a bit about NXT US and UK - focusing on Dakota Kai, and Travis Banks! Featured Music - All tracks played this week are songs used by, or related to Triple H! Including a Podcast Only track! NZ Scene, and NXT TakeOver WarGames - The Voice of Reason Sammy G is back in the MPR Studio! Tonight, he goes through recent and upcoming NZ Events in the first half of the programme; Then, spends the second half on a rundown on the recent NXT TakeOver WarGames II event! Featured music includes: Various themes from NXT! MITCHELLMANIA: Post-show thoughts - Ravishing Rosie Rude and The "Voice of Reason" Sammy G give their initial thoughts a few hours after CPW's debut event: MitchellMania - A charity fundraiser for NZ's #1 Wrestling Fan - Mitchell Fels! MITCHELLMANIA - The "Voice of Reason" Sammy G is in Wellington ahead of MitchellMania - a Charity Wrestling Event, this Saturday! He runs through IPW and UCW event results, plus upcoming NZ Shows, and opportunities for tryouts in NZ. In part two, full-focus on MitchellMania including an interview with CPW promoter, Jay Marshal, about MitchellMania recorded at Wellington Access Radio! In honour of their recent visit to NZ, all featured music throughout the show from: FOZZY! SUPERHERO JAY MARSHAL - Ravishing Rosie Rude, and Sammy G are joined in the studio by local wrestler/promoter Superhero Jay Marshal! They discuss Jay's background in wrestling as a fan, as well as the beginning of his path to wrestling, his time with NZWPW, recent events, The Rise of CPW, and MitchellMania! PLUS - Jay sets the team a creative challenge for next week's show!